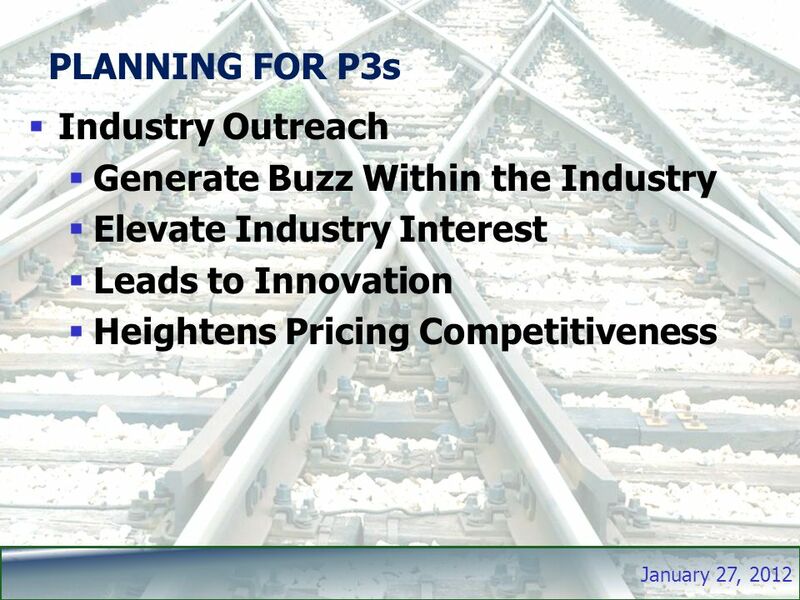 January 27, 2012 RAIL CAPACITY: Can P3 Delivery Pay For It? 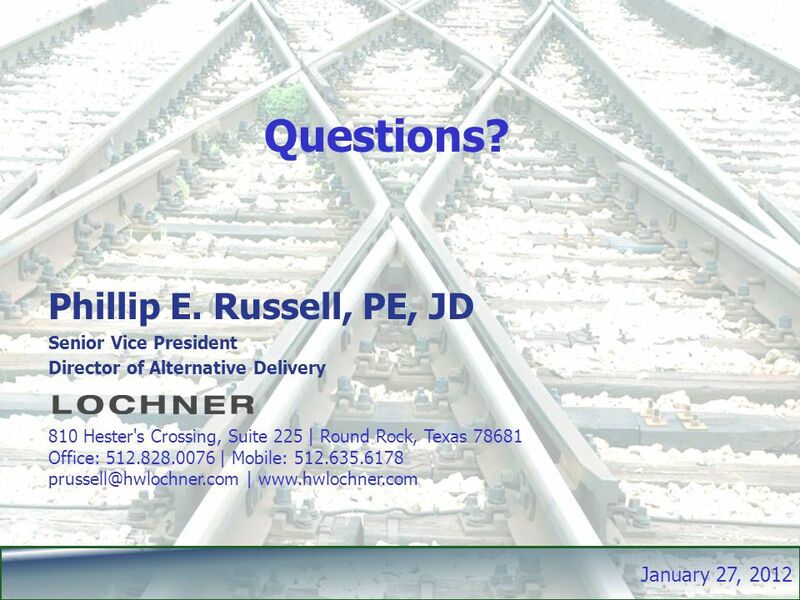 Phillip E. Russell, PE, JD Senior Vice President Director of Alternative Delivery. 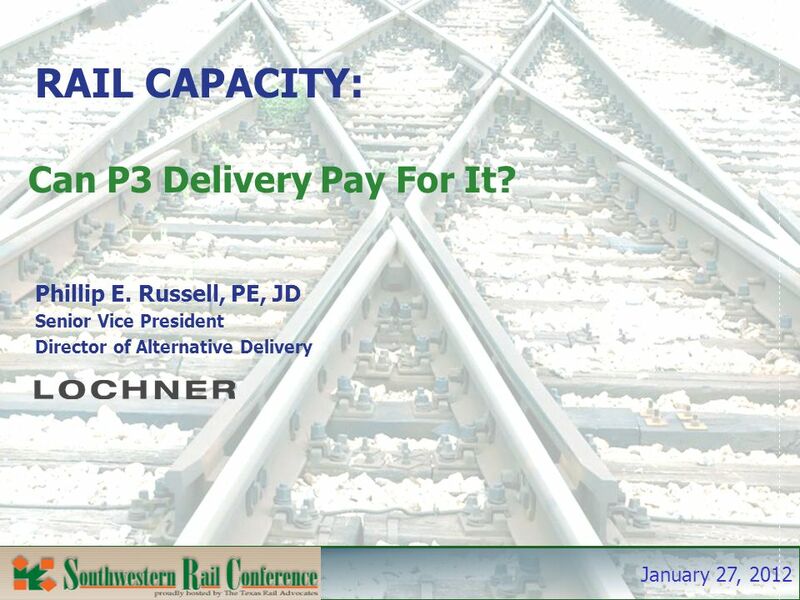 Download ppt "January 27, 2012 RAIL CAPACITY: Can P3 Delivery Pay For It? 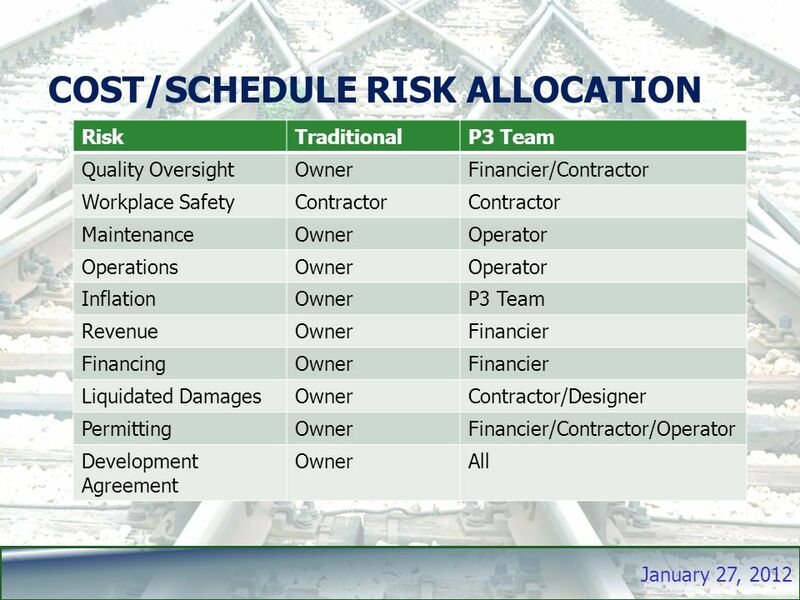 Phillip E. Russell, PE, JD Senior Vice President Director of Alternative Delivery." 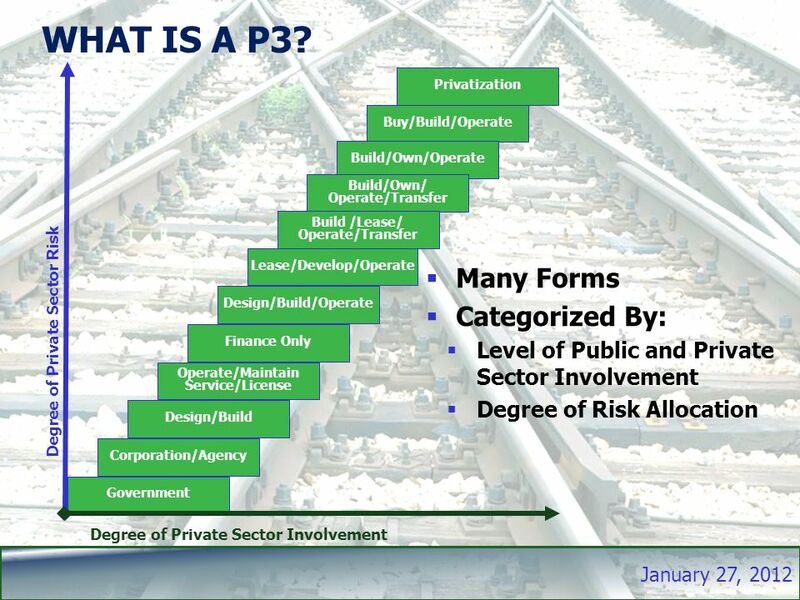 WORKSHOP 3: Building a European funding & financial framework for the TEN-T The role of PPPs & the private sector Enrique Fuentes, Development. 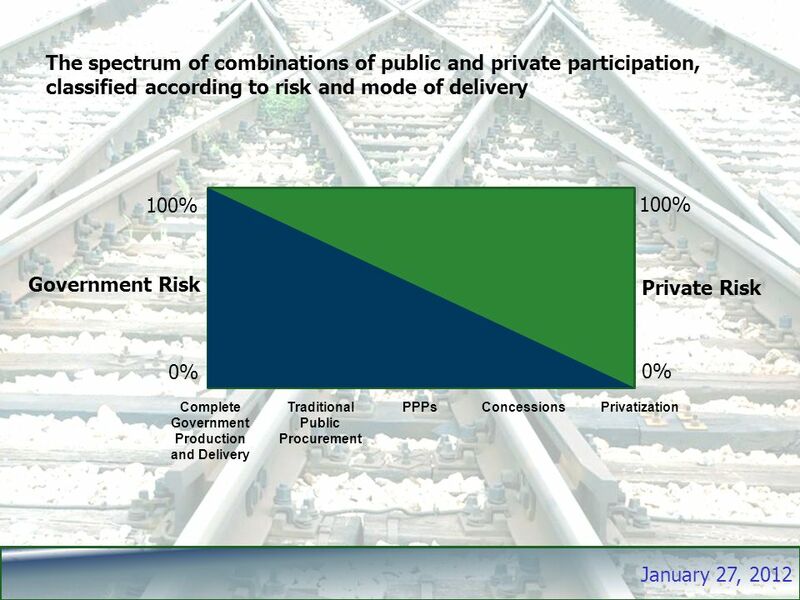 Public Private Partnerships and Development Razvojni program ujedinjenih nacija. CM/CG Contracting Tom Ravn, Mn/DOT Director, Office of Construction and Innovative Contracting. Innovative Transportation Finance March 2, 2010 Presented by: Brad Larsen Director of Traditional & Innovative Finance Minnesota Department of Transportation. 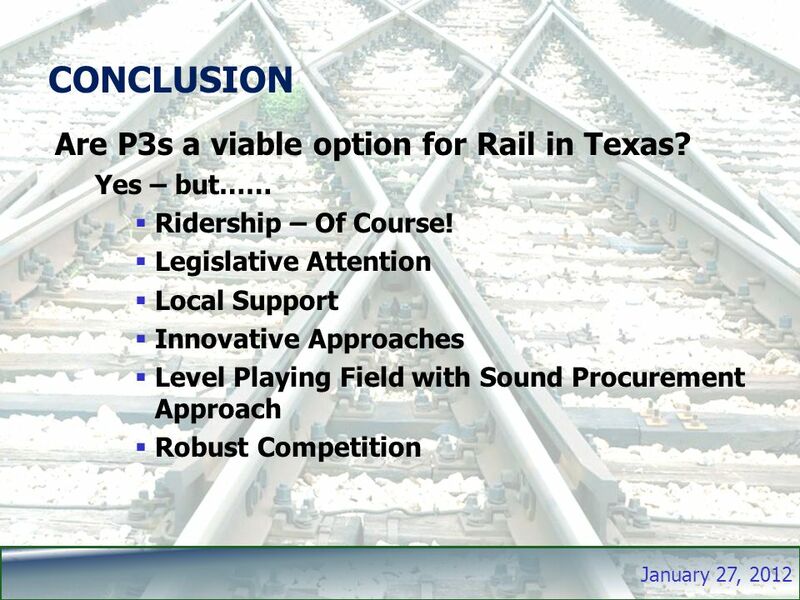 Solving Challenges Others Cannot Statutory Frameworks for Public Private Partnerships HMFA Lone Star Chapter 2009 Winter Institute Dallas, TX Christopher. 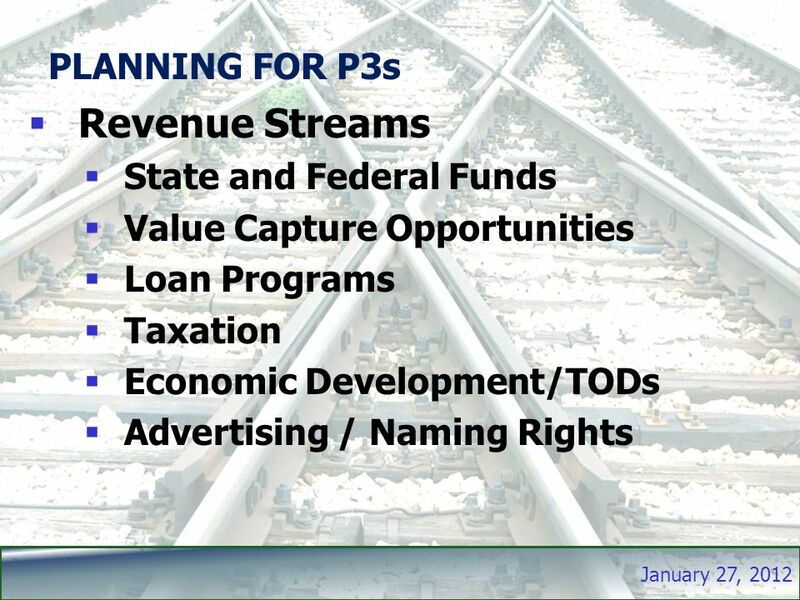 Local Funding Options for Streetcar Projects David M. Taylor, CNU Senior Vice President National Director Transit-oriented Design. 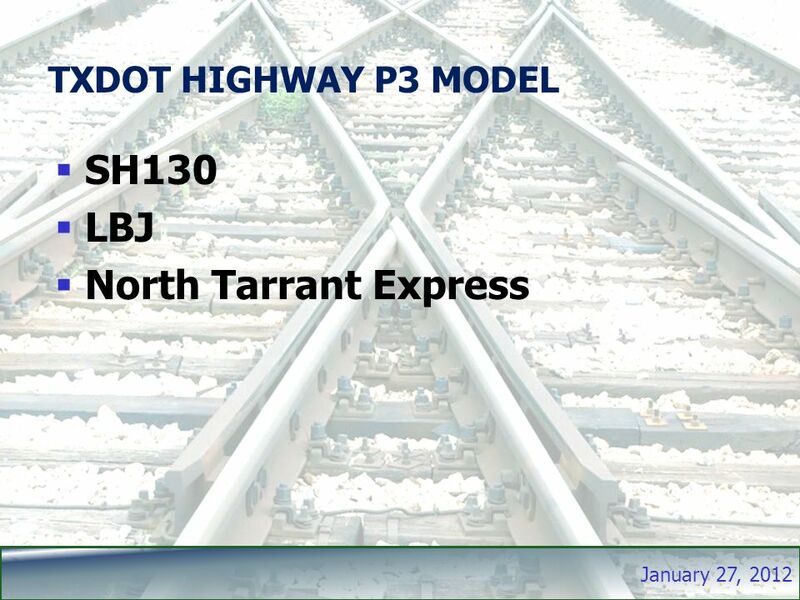 I-4 Ultimate with Lanes Project Central Florida 1 May 21, 2013. 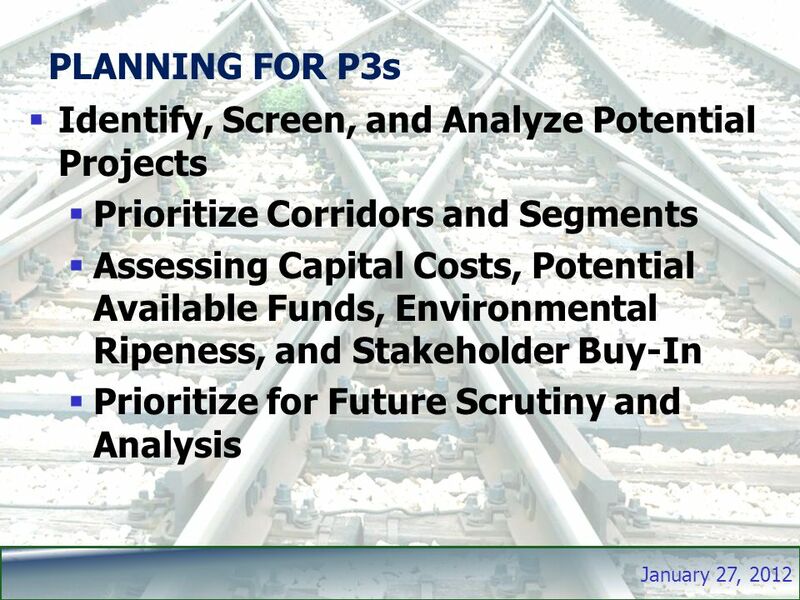 Overview and Principles for Implementing State PPP (P3) Legislation Presented at the NCPPP P3 Connect Denver, Colorado Conference By Jim Reed, Group Director. Innovative Project Delivery May 15-19, 2005 Texas Department of Transportation Texas Turnpike Authority Division Texas Department of Transportation Texas. 6 TH ANNUAL CONFERENCE. Footer Text Date PERFORMANCE-BASED MAINTENANCE APPROACH DB/P3 Edward P. Pensock, Jr. P.E. Strategic Project Division Director. Los Angeles County Metropolitan Transportation Authority Douglas R. Failing, P.E. 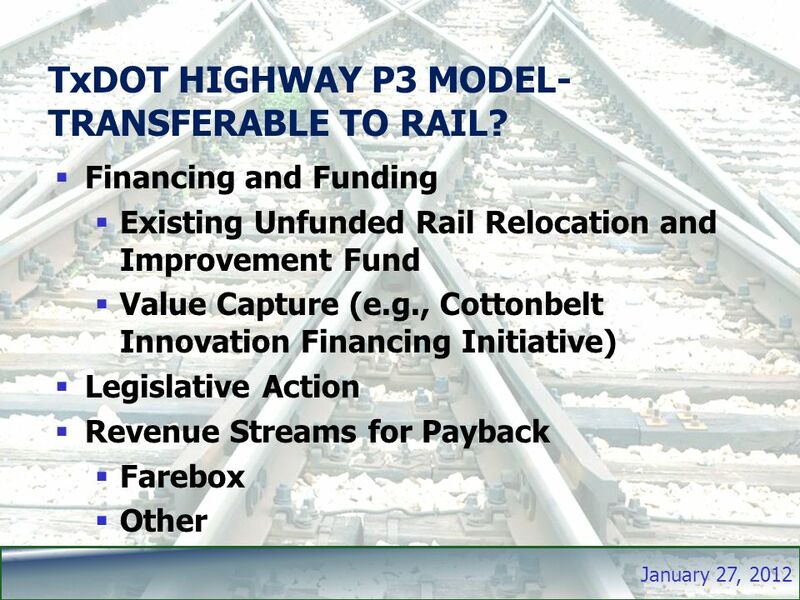 Executive Director, Highway Program Public Private Partnerships CTF Transportation. 1. Virginia’s Public-Private Transportation Act (PPTA) Northern Border Finance Workshop December 11, 2006 Thomas W. Pelnik III, P.E. Director, Innovative. Cabinet Meeting February 22, 2012 Governor Andrew M. Cuomo. 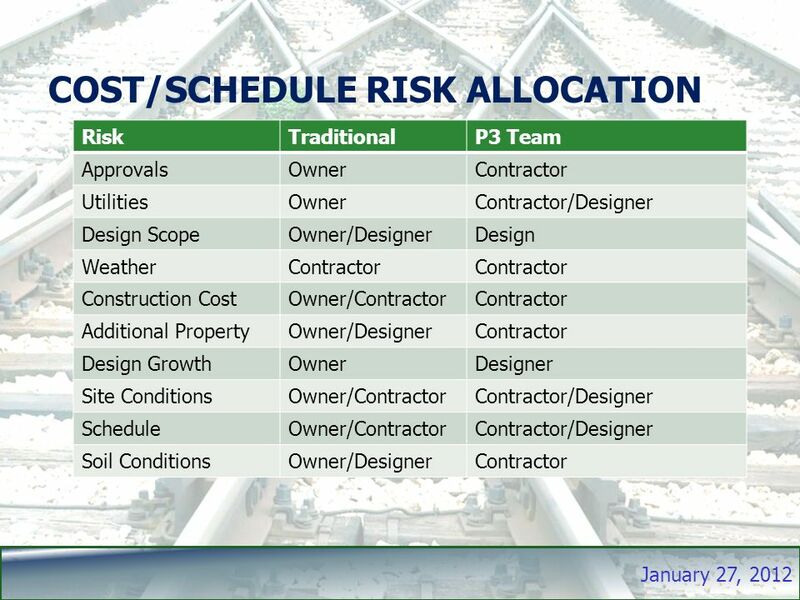 Procurement and Construction Management and Oversight What Board Members Need to Know Jerry Smiley, AICP 24 July 2013.